The English version of Wikipedia said that Karl Heinz Strobl was a messenger in the Great War. This would appear to be a bad translation of the word that appears in the German version: Kriegsberichterstatter, which I take to mean “war reporter” or “war correspondent”. He had plenty of time to carry on his writing career. 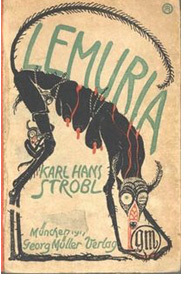 The collection of fantastic stories called Lemuria was published in 1917, and according to the English Wikipedia, he underlined his loyalty to German nationalism by writing a trilogy of historical novels about Otto von Bismarck. After the war, and the creation of new states out of the former Austro-Hungarian Empire, he became an Austrian citizen.